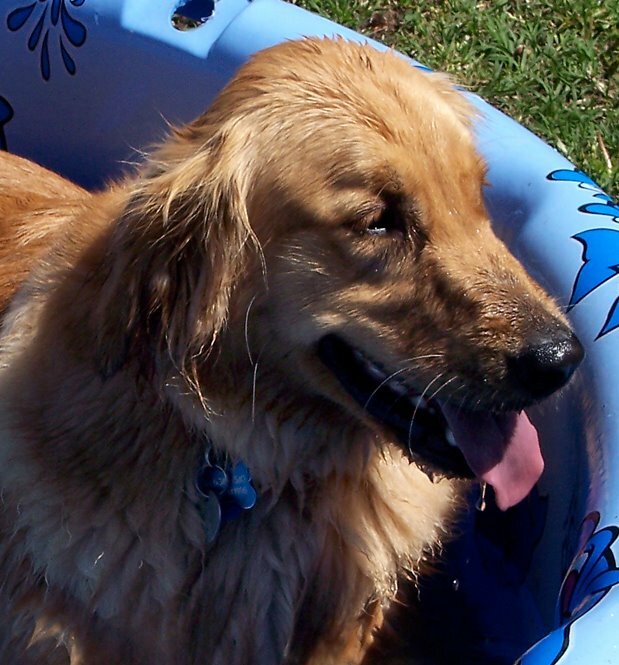 Dogs, Cats and Other Phenomena: We Want A Pool! We Want A Pool! Chant and maybe we'll get it, right? It's decided. Nikki and I want a full-blown, in-ground pool installed in the backyard now! Yes, the idea has always been simmering in my head since I was a little girl, but now Nikki agrees whole-heartedly with me. See, it all started today when Nikki and I went on our walk. I had been hoping that we'd run into a neighbor who lives around the corner from me. He saw me walking Nikki a long time ago (when she was still quite the young pup) and he told me that he had two golden retrievers and it was too bad that he was leaving right at that moment, otherwise they could play. Well, today must have been our lucky day. Nikki and I were walking and she kept turning to look behind her. Finally, I turned too and there they were - the two Goldens and the neighbor, Bill. The dogs, Molly and Lacy, were well trained and stayed on their front lawn until Bill told them that they could greet Nikki. They ran towards us and the sniffing commenced. Molly, a blonde Golden who was heavier than Nikki, growled a bit, but Bill assured me that that was just her way of showing she was dominant dog. I was surprised to see that Lacy looked just like Nikki, only much thinner. Bill invited us to his backyard so the dogs could play. I knew he had a pool, so thought this would be interesting for Nikki. Bill had a cover on the pool, which meant that Nikki didn't realize that this was not solid ground so she plunged right into the pool within a minute of entering the yard. She was very surprised, plus she was in the deep end, so I was a little concerned. She somehow made it over to the edge and Bill pulled her out. Molly and Lacy kept diving into the deep end to retrieve the tennis ball that Bill threw into the pool. Nikki wanted to play too, but wasn't sure about this pool. She even had to learn how to walk around the side of the pool as she kept slipping. Bill and I coaxed her to go into the pool but finally, since his shorts were already pretty wet, he pulled off his shirt and went into the pool. He dragged Nikki into the pool with him and held her. Then we kept showing her the steps to teach her where she could get out. It helped guide her when I stepped on the first step ... my sweat pants were soaked anyway, so it didn't matter. Nikki had to learn how to swim but it sure didn't take her long. Besides, Goldens love the water! She got to be a pretty good swimmer and got over her anxiety rather quickly. She even got the ball several times and paddled back to us. Naturally, she didn't want to give up the ball easily. True, her splashing was pretty noisy - she didn't glide through the water like Molly and Lacy - but that will come in time. Nikki, Molly and Lacy had no problems adjusting to one another. In fact, the adjustment was rather seamless. I wonder if they somehow recognized that they were all the same breed, so that trust was pretty much built-in. That's my explanation for it anyway! We had such a great time! I sure wished I had my video camera on me to record Nikki's first swimming lesson. But I'm serious here. Nikki and I want a pool. What fun we'd have together! By the way - I've posted some more pics of Cora today in response to a comment I recieved - hope you enjoy them. I don't understand... Bill had a cover on his pool, but Nikki jumped in? What, did she break through the cover? Yes, it wasn't the kind of cover you could walk on - just rather thin. Probably helps keeps leaves out, etc. So she didn't see the water and just walked right out on it and plunged right through! Kayla is Thrown a Surprise Birthday Party!